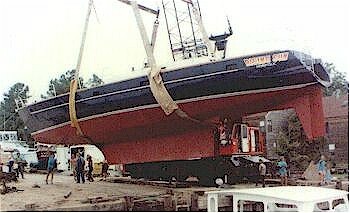 This boat was drawn in 1984 as a custom design for professional builder Howdy Bailey, to give rapid and simple construction while having a round bilge appearance above the waterline. She is also suitable for construction by amateur builders who have the resources to build such a large yacht. The hull is of multi-chine form with 3 chines each side, the top one being rounded to 1,25m radius and plated with pre-rolled steel cut to suit on site. The structural design uses a longitudinal stringer system over transverse framing. Where possible, frames are positioned for attachment of plywood bulkheads. The long fin keel gives good spread of ballast and contains all the tankage below the cabin sole on centreline. The leading edge is steeply raked for windward ability. This keel, combined with the skeg hung rudder far aft, gives good tracking characteristics and an easy boat to handle on all points of sail. The flush deck/centre cockpit arrangement gives large open deck areas. The cockpit has a broad well with plenty of legroom and has a central raised section as a foot brace for windward passengers. Also within the cockpit is a large flat area for lounging in the protection of the coamings or a dodger. At the stern is a swimming/ boarding platform for easy access to the water and charter toys. The accommodation is laid out for charter work with three equal double guest cabins, each with en-suite heads and shower. The crew accommodation comprises two double cabins sharing a heads and shower. The saloon has a large dinette to starboard and a library area with easy chairs to port. Aft of those are the nav station and galley, with space available for extras such as ice maker, microwave, washer/drier etc. Auxiliary power is from two 75hp diesel engines, each in it's own engine room, seperated by the passage to the aft cabins. This arrangement gives 100% redundancy in the event of engine failure, limiting the chance of lost charters. The wide seperation of the engines gives easy manoeuvring under power. The rig is staysail schooner and, although she has a large sail area, no working sail exceeds 52sq m. This is a versatile rig in the range of options available to suit conditions and the ease of use by a small crew. 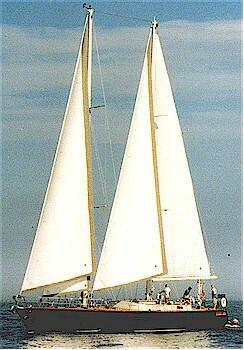 The jib and staysails can be roller furled or hanked. This design provides a fast and comfortable cruiser for charter work or those who require plenty of accommodation. She is easily handled under sail or power, her moderate draft allows her into most cruising areas and her strong construction will take her passengers safely wherever they may want to go. Testimonial from Carolyn Murphy - Coskipper of DIX 64 "Rising Sun"
This boat is a sailing fool. We left Norfolk in winds 15-25kt and seas 10-14'. Turned off the motor at the bridge-tunnel outside of Little Creek and took off like a rocket. We made 210 miles the first 24 hours. She goes 1/2 the wind speed. We were making 11kt under 2 reefs in main and all rest full standing. Picked up the lights of Bermuda at Sundown. We tried to slow her up so we dropped the main (she went from 10 to 9). So we also rolled in the fore staysail - went down to 8. She just wants to go! We could have been in Bermuda in 3 days 10hrs but it was 3 days 20hrs since we had to wait all nite for daylite to go in. Your boat is great - the brokers love it. It is the talk of the trade down here. Follow these links to a stability curve, a material list for the structure or a list of drawings for this design.